I recently attended the Symposium for Chief Staff and Elected Officers led by Glenn Tecker and presented by the Canadian Society of Association Executives. This is an event that I attend each year with a volunteer leader from one of the associations that we manage as an association management company (AMC). While the content does not change drastically from year to year, what I learn does change. Different information stands out to me based on the challenges facing the association leader I attend with. Do you see any of the four challenges within your association? Does your association suffer from Slow Process? Without role clarity nothing gets done and great leaders will walk away in frustration. How do you create this clarity? Agreement. Put roles in writing and discuss them together. Simply writing it down is not enough – you need to review roles and responsibility together with all parties to ensure that everyone has the same understanding. Does your association make Political Decisions? Volunteer leadership roles may change from year to year in your association, but making decisions to appease one or two members or volunteer leaders means that not enough is being done to serve the core. Understanding role clarity means that no one person can dictate their own personal agenda. The fourth point, Permission to Proceed Loops, was not a concept I had thought a lot about, but is explains why some projects never seem to end. Without a group of leaders understanding when permission is required to proceed, advancement with agreement cannot occur. The clarity of roles is especially important when mandates are given to a committee or task force by the association’s board of directors. Association committees and task forces are created to fill a specific need and that need must be clearly defined. Often the need is to develop a specific program or answer a certain question. In establishing a working group, a board of directors must clearly define the scope of work, reporting structure, deadlines and other key information. In many cases, it is also helpful to outline what is out of bounds. Often, a committee or task force will be established to provide guidance on the creation of policy. This does not mean that the board is giving up its authority to approve policy, but rather it is looking for assistance in developing policy. This distinction is not always as obvious as it could be for association leaders sitting at either table. How is the Role of the Chief Staff Officer Viewed by All Volunteer Leaders? 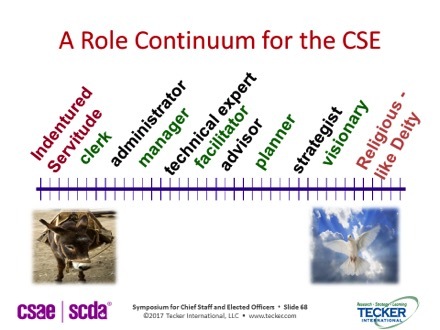 One of the interesting exercises regarding clarity of roles at the Symposium for Chief Staff and Elected Officers is for both the volunteer leader and staff leader to review, how they feel the board of directors views the chief staff officer, or as Tecker calls them, the Chief Staff Executive (CSE). This can be done with a scale (see below). This an interesting exercise for both volunteer leaders to do individually, to compare as a group, as well as to compare to how the chief staff officer believes they are viewed. If volunteer leaders don’t hold similar views or if they differ from how the chief staff officer views themselves than this is a strong indication of the lack of role clarity. It is important to take a range of views in this exercise, rather than the opinion of one single board member. 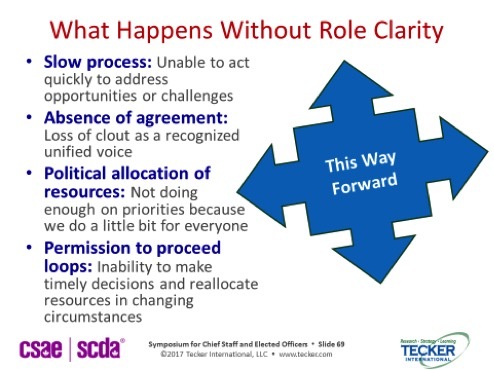 The lack of role clarity leads to frustrated volunteer and staff leaders, and is often a symptom of poor communication. Clearly communicating roles is essential to having a productive board, staff, volunteers and committees. Use this framework to think about how roles are assigned and work is monitored within your association. In the end, everyone will benefit from better communication and agreement. Thank you to Glenn Tecker and Tecker International for permission to share the slide included in this article. Information regarding Symposium for Chief Staff and Elected Officers and Tecker International can be found at www.tecker.com. Association Collaboration – Is Your Association Partnering for Success? You’re Ready for the Board Meeting, But Are the Board Members?